In this episode we meet Heather Betts. The Sydney-born painter has been living in Berlin, apart from a few years, since 1984. Heather is a graduate of Sydney’s Fine Arts Institute, but she also studied viola at the Sydney Conservatorium of Music. 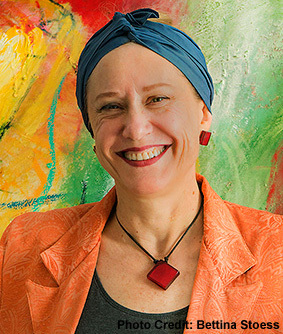 Heather moved to Berlin with her husband, Brisbane-born musician, Brett Dean, where the couple studied at Berlin’s Hochschule der Künste, known today as the University of the Arts or UdK. Heather has had over forty solo exhibitions, as well as numerous group exhibitions. The influence of her viola studies is omnipresent, as music is a leitmotif of much of her work. Heather’s paintings are developed in series, many of which have been inspired by operas or dramatic musical compositions. Indeed it is obvious that Heather and her composer husband Brett, have found much inspiration in each other’s work. When Breandáin caught up with Heather she talked firstly about those early days in Berlin, a very different city to that of today in a time when the German capital was still divided by the Berlin Wall. And about a special friendship Heather shared with Rosie, a prima ballerina from East Berlin that led eventually to her assisting Rosie and her family to escape the Communist regime.